PALM CITY, Fla. – Teenager Kristian Caparros of Hollywood fired a six under par 65 Thursday for his second victory on The Minor League Golf Tour, his first as a professional. Caparros, 19, eagled the par-5 13th hole and made seven birdies and three bogeys on the Osprey Creek course at Martin Downs Country Club. It was just his 11th Minor League Golf Tour start since last September. 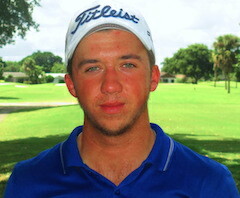 He won as an amateur the second time out, Oct. 8 on the East course at Jacaranda Golf Club in Plantation. Caparros received $1,000 from the $5,628 purse to raise his career earnings to $3,359. Pictured above is his only long birdie putt of the day on Hole 15 where he made a 30 foot putt. Three players tied for 2nd place at 4-under par 67, Jordan Elsen of	Kenosha, WI, Will Coleman from Kensington, MD, and the career Minor League Golf Tour Leader in earning (164K) and victories (43) Jimmy Lytle. Lytle also finished T2 on Monday and T8 Wednesday at Abacoa. His solid week can be attributed to a phenomenal 54 hole stretch with his putter. Lytle had 24 putts on Monday, 22 putts on Wednesday and just 21 putts today, giving him just under 1.25 putts per green for the week! Six players tied for 5th place at 3-under par 68. The third tournament of the year drew 42 entries. Next on the schedule: Monday, Fountains CC, Lake Worth; Wednesday, West Palm Beach GC; and Thursday, Jacaranda-East.